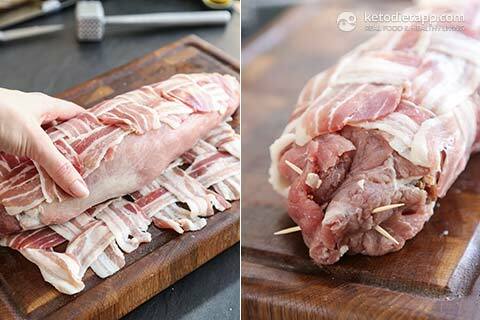 This one is for meat lovers: mouthwatering pork tenderloin filled with juicy sausage meat and wrapped in crispy bacon! My keto & paleo version is based on Bam&apos;s Kitchen recipe. I used flax meal as a grain-free alternative to breadcrumbs. Due to it&apos;s egg-like binding properties, flax meal holds the filling together and the sausage meat doesn&apos;t crumble when sliced. 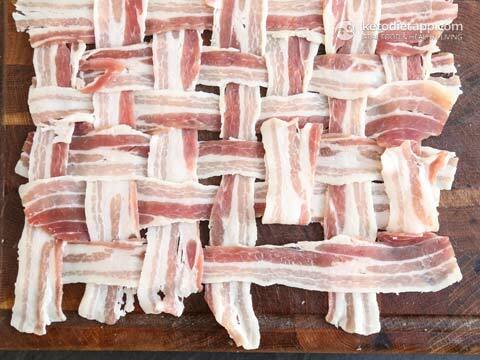 Looking for more recipes using bacon net? 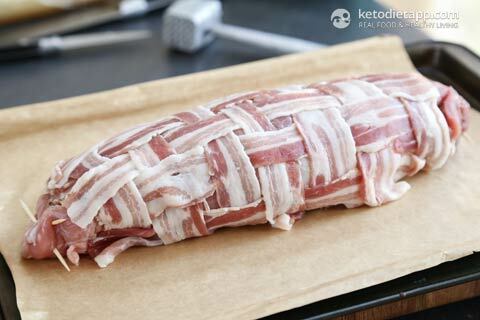 Check out this Meatloaf from the KetoDiet App! Prepare the filling. Finely dice the onion and garlic. Place on a pan greased with ghee and cook over a medium-high heat for a few minutes, until fragrant. 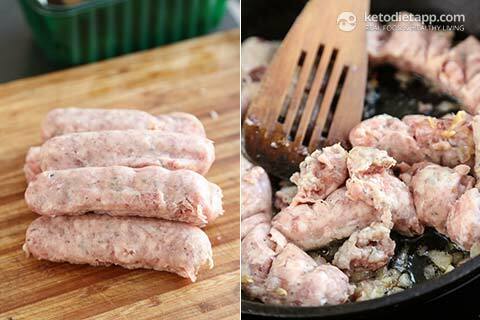 Remove the sausage casing and place the sausage meat in the pan with onion and garlic. Break into smaller pieces with a spatula. 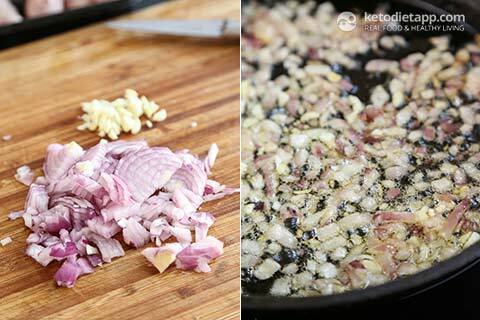 Cook until the meat is browned from all sides. This will take just 6-8 minutes. Then, use a slotted spoon and transfer the meat in large mixing bowl. Add the sage and flaxmeal and season with salt and pepper to taste. Set aside and preheat the oven to 190 °C/ 375 °F. 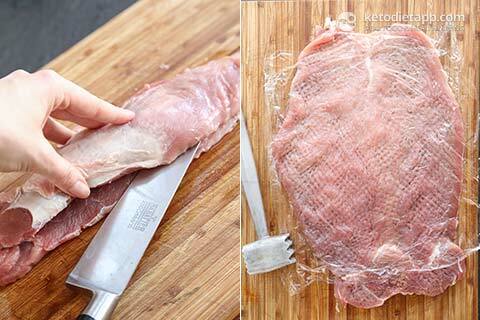 Prepare the tenderloin (also known as pork fillet in the UK as opposed to pork loin which is much bigger). Cut the tenderloin lenghtwise almost all the way through leaving out about 1/2 inch (1 cm) so you can then open the tenderloin like a book. Cover the tenderloin with a piece of cling film and evenly pound the meat with a meat tenderiser/ mallet until about 1/2 inch (1 cm) thin. When done, set aside. 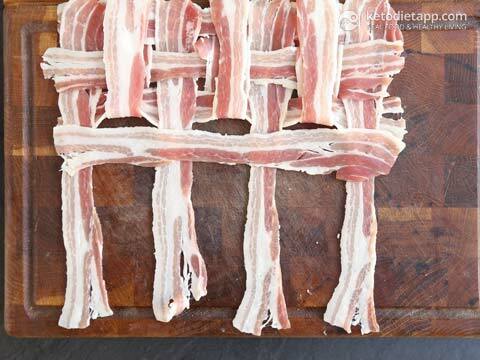 ... to create a bacon net. 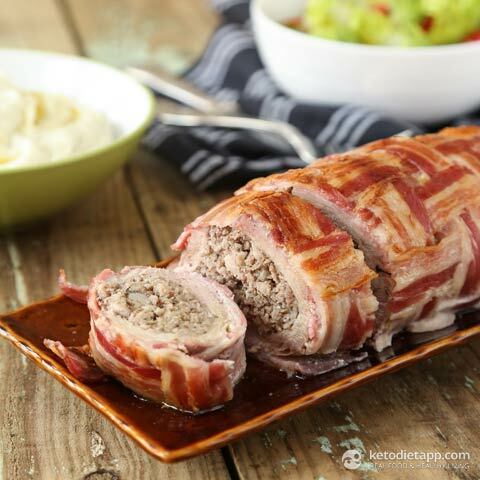 Put the pounded tenderloin over the bacon net and place the sausage stuffing in the middle so you can tightly roll it up lenghtwise. 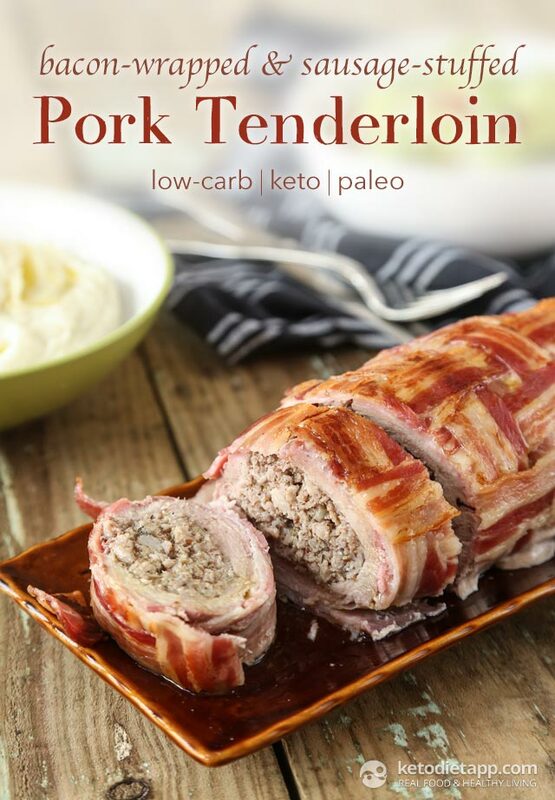 Move the rolled tenderloin to the edge of the bacon net and roll it to wrap it round the tenderloin (be careful not to spill the filling). 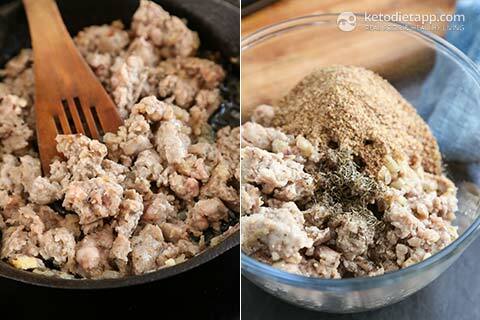 Secure the edges of the tenderloin with two toothpicks on each side so the sausage stuffing stays inside. Place the tenderloin on a rack or baking sheet seam side down. 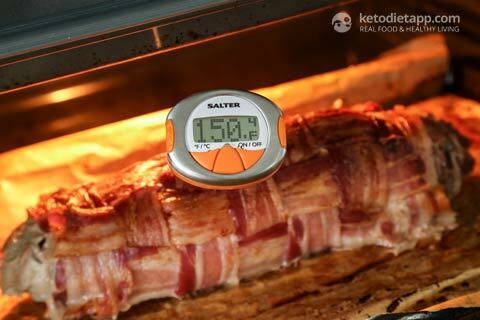 Bake for 35-45 minutes or until your meat thermometer reads 63-68 °C/ 145-155 °F depending on how well done you like it to be. 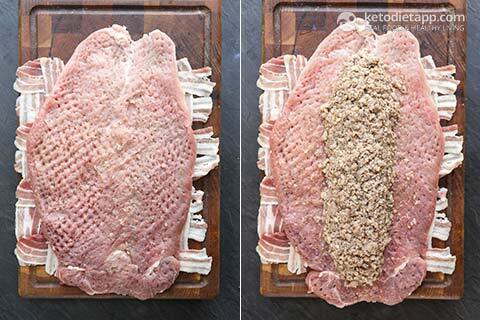 If the bacon is not crisped up enough, place under a broiler for a few minutes. Remove the tenderloin from the oven and let it rest for 10-15 minutes before slicing and serving. Remove the toothpicks. Try with Ultimate Keto Gravy or Keto Cheese Sauce, crispy greens or Keto Cauli-Mash. I made this for 6 people using two pork fillets and 500g of sausage meat. I added a handful of finely chopped mushrooms to the onions, sausage meat and garlic and made a thickened mushroom intense sauce from chicken stock, black pepper, 2tsp of Dijon mustard and soaked porcini mushrooms. Cooked for 45 minutes at gas 5 and basted towards the end to keep very moist, this was lovely. Everybody enjoyed the meal which was served with roasted baby new potatoes, cauliflower and mange tout. I will make this again. Thank you. Hi MartinaI made this over the weekend and served it with Hollandaise Sauce, brussel sprouts fried in butter and a little lemon rind and a courgette cheese bake. I put up a photo on FB so hope you get a chance to see it. It was an instant hit with my family. Thank you for sharing. I urge EVERYONE to try this recipe with the mustard sauce from the past post. Together, they are a match made in keto heaven!! !